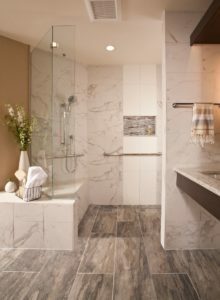 SEATTLE, WA — Aesthetics and accessibility were on full display in Designer Diane Foreman’s latest bath project, which won the National Kitchen and Bath Association’s top award for Universal Design in January 2017. Foreman’s clients originally purchased their 1980s-era ranch style home with the idea that it would be remodeled to fit their evolving physical challenges. 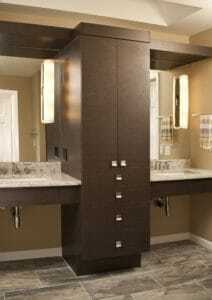 In particular, they needed a master bath that offered wheelchair access, but still contained all of the storage, functionality and style one would expect in a contemporary bathroom space. Their existing bath was full of issues: a shower area that was too narrow and ill-equipped to use comfortably, a large soaking tub that wasn’t being used at all, a walk-in closet that was awkwardly shaped and difficult to access, and poor lighting from an overhead skylight. 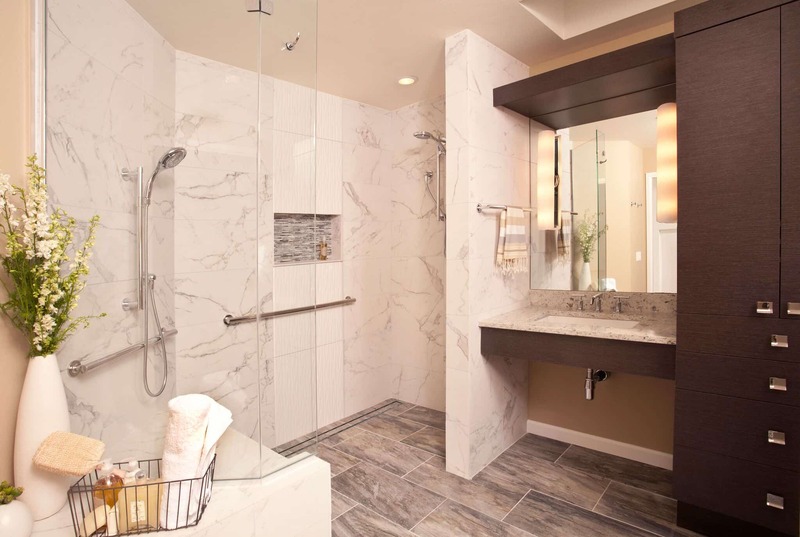 In place of the old shower and tub, Foreman added a massive, zero-threshold walk-in shower with dual handheld showerheads, one at standing height, the other at seated height near a built-in bench. An additional bench for seating while dressing was placed just outside the shower. Grab bars were installed throughout. A T-shaped wheelchair turnaround space was designed to ADA standards, and a 36-inch wide pocket door was located at the entry from master bedroom to master closet to allow greater ease of passage. A new set of vanities with ample room for knee clearance and a new linen closet with toe-kick access were also installed. Finally, a soffit for down lighting, dual mirrors, and additional LEDs made the space considerably brighter. 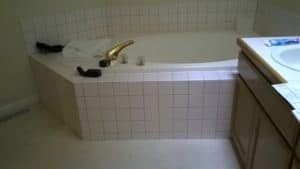 Overall, the bath was treated with Foreman’s unique design sensibility, including simple lines, warm neutrals, and contrasting materials. Above: After remodel, dual sinks are separated by custom cabinets. Foreman noted that a thoughtful and consistently caring approach is the key to maintaining trust with clients over many successful projects. “The client relationship is an example of what Neil Kelly Company does best,” she said. Photos by Roger Turk of Northlight Photography.